The Corvette C6.R brought the thunder to France...so cool to see it here. Summer was a time of transition for me. I moved from Metro Detroit back to Chicagoland, and found a (horrifyingly busy) new job to keep me insured while I attempt to strike out as a freelancer. Sadly, this means I’ve had to leave behind Detroit’s amazing Cars & Coffee weekend events. Mostly. 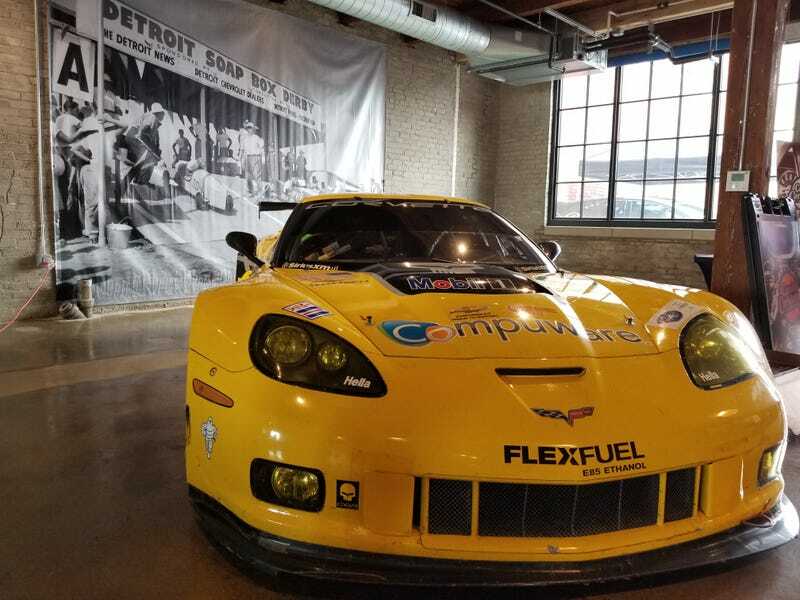 I always make time for Autoweek’s events at Detroit’s Factory in Corktown. Especially when they were showing the 24 Hours of Le Mans. And especially especially when I knew what cars were going to be shown off. The parking lot set the stage. This alone was worth the trip. The R8 left before I could snap more photos, but I think I got the most important detail. Inside, the race was being broadcast on the brick wall, and coffee flowed like oil through an engine. But I had trouble keeping up with the action; I had many distractions. Although the Capri started production in late 1968, the world had to wait until 1972 for the first cars to start racing. To do so, Ford homologated this: the Capri RS2600. The cars were built in the Cologene, Germany plant, and modified to the gills for competition. I need seats this shade of 1970s orange IMMEDIATELY. One of these mods was Westlake’s 2600 motor (hence the name), a 2995cc V6 delivering 320 horsepower. Let the trumpets blare, and knock down these walls. God, do I wish I could hear this thing roar. And roar it did: this very car, VIN GAECLJ19997, won the 1972 European Touring Car Championship, before being modified further for the 1973 season. And, if the poster next to it was accurate, it also raced at Le Mans. After the 1973 and 1974 seasons, the Capri was sold to a buyer in the US. That owner only raced it twice before selling it to someone else in 1976. This second owner raced it five more times, before money problems forced the car into a trailer in 1981. And there the car sat, until rediscovered in August 2016. RM Motorsports was tapped to perform the restoration, with Michigan’s own Roush Industries performing the engine work. If it isn’t already obvious, they did an amazing job. More details about the restoration and history can be found www.capricologne.com. Joining the Capri in The Factory paddock were a few more Le Mans competitors. Unlike the freshly restored Capri, though, these ones still bore their battle scars. But they wore them like badges of honor. Oh no! Quick! Someone’s left the V10's cage unlatched! This snake’s fangs may be chipped, but it can still bite hard. This might be the most ‘Merican thing I’ve ever photographed. I think, even knowing how raw and rough it was—especially in the early years—a lot of people miss the Dodge Viper. Here’s hoping the fortunes of the world change enough for it to be revived one day. In the mean-time, the US is well represented by the Corvette teams. This C6.R has earned its rest. It’s rare to find two Ford GT’s in the same place, especially given the No. 67 car’s history. The initial shock of the GT’s existence may have faded, but no matter how many times I see it, I’m always shocked and awed. It’s the six-year-old within me, gasping at the fighter-jet bodywork, like a Hot Wheels fever dream come to life. That’s the magic of Le Mans. May it continue to inspire and drive innovation and passion. If you look WAY to the right, my Miata’s in the shot! There were only ever 7500 10AE’s made. And I ran into another one, #553 (right), on the way back home.